Right, time to wrap this up, thank you for joining us for what has been an incredible day of Premiership rugby. 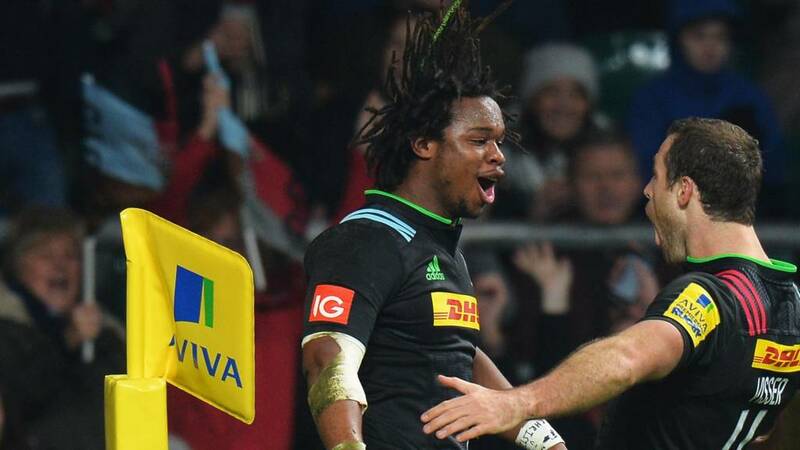 Saracens return to the top of the Premiership with victory at Wasps - report. To be involved in a game like that shows the quality of players in this league. It was incredible, we weren't accurate enough and tried to play with too much ambition. I think we'll get stronger as the season goes on, I just hope we don't concede many tries like we did today. I'm sure it was good to watch, it was horrendous from our point of view. We played some outstanding rugby. It was quick, open. We played some great rugby but gifted them three interception tries so we are disappointed. We showed great courage, but that never-say-die ambition got us back level. We are encouraged to play rugby but that comes with an element of risk. It almost came back to bite us today. The lungs are blowing a bit, it's a great club a professional set up and that's all you can ask for. I'm really happy. So with round seven now done, this is how things stand in the Premiership. Leaders Saracens remain unbeaten while Newcastle are now bottom. Gutted to miss the drop-goal at the end. We gave them too many easy points, but a good fightback. We pride ourselves on that. A few of the crowd probably haven't got much hair left after pulling it out. What happened? I blacked out. Gloucester came here and went at the hosts in a way that said, 'we're not going to lay down'. Nobody gave them a chance before the game. So it's a bonus point each as they game ends all square. Time to catch breath! Quins have one last chance but the ball is lost and it's all over. What a game. What excitement. Quins win the line-out, and they start going through the phases. Nick Evans is in the pocket and he's fed the ball. His drop-goal is agonisingly wide of the posts. That was so, so close. Apologies, it's closer than 22. Quins are in Gloucester's 5m. We have two minutes left and it's all square. Can anyone win it? Nick Evans kicks Quins into Gloucester's 22. Gloucester are really under the cosh now. Quins threw that last line-out to the front and kept working and working until they moved it wide to the left. It is absolutely bedlam out there! Quins win the line-out but Gloucester get a good drive on. Quins re-set the maul and go again and they're within metres. They recycle the ball and Ross Chisholm goes over in the left corner. Nick Evans holds his nerve and curls over the conversion too. We're all square! That's not a good situation to be in really. When it comes to scrummage time, they'll need to sacrifice someone Gloucester. You'll anticipate a drive now from Harlequins. Richard Hibbard is sent to the bin for collapsing the maul. Gloucester down to 14-men and it's another line-out, 5m out. Five minutes left.